'My experience with him has been good and I appreciate the work that he has done,' Narendra Modi said about RBI Governor Raghuram Rajan. 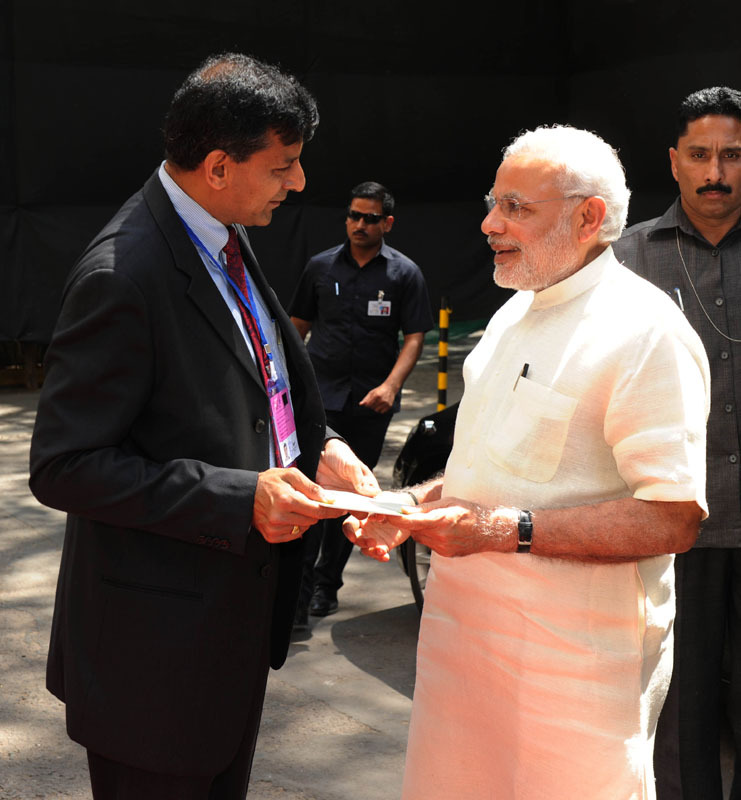 IMAGE: Narendra Modi says Raghuram Rajan is patriotic. Prime Minister Narendra Modi on Monday disapproved of party MP Subramanian Swamy's attacks on RBI Governor Raghuram Rajan and some top finance ministry officials saying they are "inappropriate". Calling Rajan "no less patriotic", he virtually ticked off Swamy saying "if anybody considers himself above the system then it is wrong". The Prime Minister's comments assume significance in the context of Finance Minister Arun Jaitley and the BJP distancing themselves from Swamy's recent attacks on Rajan, CEA Arvind Subramananian and Economic Affairs Secretary Shaktikanta Das. Swamy also had made some carping comments about Jaitley without taking his name. "Whether it is in my party or not, still I think such things are inappropriate. This fondness for publicity is never going to do any good to the nation. People should conduct themselves with utmost responsibility. If anybody considers himself above the system, it is wrong," the Prime Minister told Times Now. Without taking the name of Swamy, Modi was asked about the comments of "your Rajya Sabha MP" in the context of Raghuram Rajan and queried whether it was appropriate. Even after that there have been criticisms made against very senior government officials, the questioner said recalling Modi's recent counsel to party leaders in Allahabad to maintain balance and restraint in their speech and conduct. "My message is very clear. I have no confusion about it," Modi said when he was asked whether his message on the issue is clear. Modi then went on to praise Rajan, who has said no to a second term in RBI, saying his patriotism was no less and was sure that he would continue to serve India irrespective of whether he was in some position or not. "My experience with him has been good and I appreciate the work that he has done. He is no less patriotic. He loves India. Wherever he will work, he will work for India and he is patriotic," he said in an apparent riposte to Swamy's attack that Rajan not mentally fully Indian. Referring to apprehensions whether Rajan would be allowed to complete his term, the prime minister said though he was appointed by the previous UPA government, Rajan would be completing his term.